More than a month ago, my brother put all his eggs into one basket and jumped off the dock. It was an autumn wedding, unusual but not unheard of, and despite being out of season, neither he nor his bride could have asked for a better send-off as they embarked on their new adventure in life, together as man and wife. Without a doubt, the main sartorial focus of the day was the bride – it always is, even when they look like meringue explosions – but this attention was entirely deserved; the men tipped their hats as a show of reverence to an elegant, Grace Kelly-esque lace-dominated creation, with a huge lace train, as it passed by. However, the men of the groom’s party were not outdone; the groom informed me many moons ago that he wanted to be the equal of his bride on his wedding day, not a fawning servant in a rented outfit. Bespoke and distinct was the order of the day. Morning dress was always the choice but not the usual garden variety, black jacket and spongebag trouser affair. Instead, a navy herringbone wool was chosen for the jacket, and a navy and white houndstooth wool for the trousers. The jacket was to have grosgrain piping around the lapels and the hem, and the double-breasted dove grey waistcoats would be cut shorter. The ushers were dressed similarly but wore the standard black jacket, striped trousers and single breasted instead of double breasted waistcoat. Ties were chosen over a traditional pinned-cravat(Ascot) – viewed as fuddy duddy – and the shirts were all varieties of blue with a contrasting white collar. 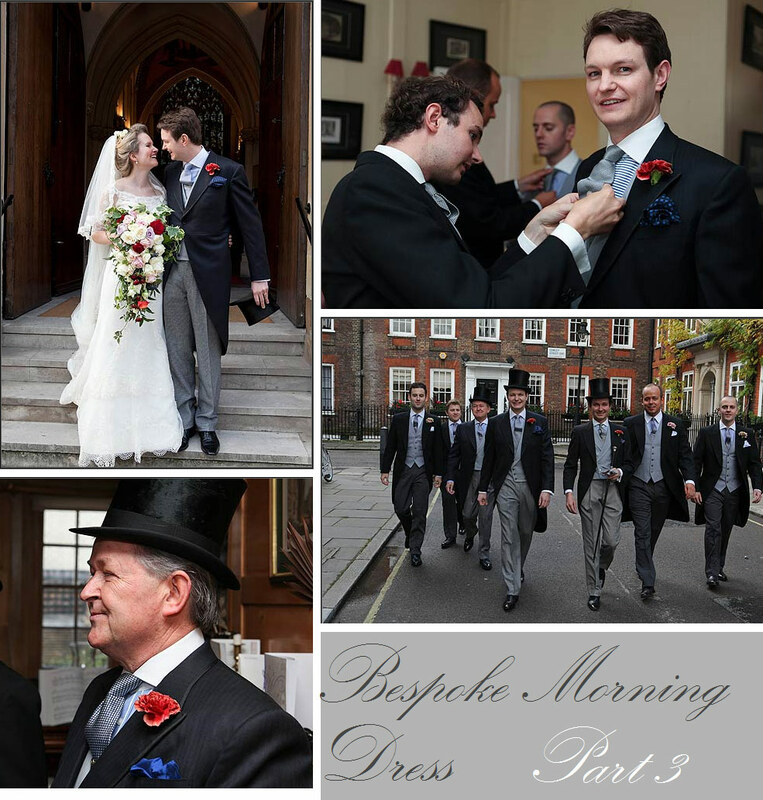 Pins were worn in the ties – the groom’s was a blue topaz and gold antique – and the buttonholes were a single carnation. The men of the groom’s party also wore antique silk top hats. Despite causing such temporary misery, the creations are entirely unique – which is the whole point of bespoke clothing – and will be loved and worn by their owners for years to come. Much like his lucky bride, the groom had a vision of his own wedding day. Fortunately, he was also able to realise it. Your morning dress is very nice, Winston! My coat is a fraction shorter, and slimmer, than the others. I just prefer this silhouette. This picture (http://3.bp.blogspot.com/_tDZhmux-ePI/TPFm65J8GAI/AAAAAAAABO0/MuE7OFKctEY/s1600/New%2BPicture%2B%25289%2529s.bmp) shows that it isn’t quite as short as it appears in the above photo. The cane and the topper are both antiques! Very nice. I like the contrast of the pale trousers with the dark coats.